Chaenomeles japonica is a species of Japanese Quince in the Rosaceae family. It is a thorny deciduous shrub that is commonly cultivated. It is shorter than another commonly cultivated species C. speciosa, growing to only about 1 m in height. The fruit is called Kusa-boke (草木瓜) in Japanese. Chaenomeles japonica is also popularly grown in bonsai. It is best known for its colourful spring flowers of red, white or pink. It produces apple-shaped fruit that are a golden-yellow colour containing red-brown seeds. The fruit is edible, but hard and astringent-tasting, unless bletted. The fruit is occasionally used in jelly and pie making as an inferior substitute for its cousin, the true quince, Cydonia oblonga. That is a wonderful pinkish red and the petals have a nice shape to them as well. What a beautifully photographed red flower. I find matte red petals the very hardest to render properly with my Canon. I'm guessing you use a different camera? beautiful plant! nice colour on a winter's day! I have one also, if you are interested look at http://pippavier.blogspot.de/ please. Thanks, Pippa! You have a very interesting blog. I shall be joining some of your creative memes! Yes, I think I konow this plant ... Very pretty capture! Wish you a very nice Weekend. We have the Japonica too in our garden. But ours was already blooming in April - here in our area that's the usual time. 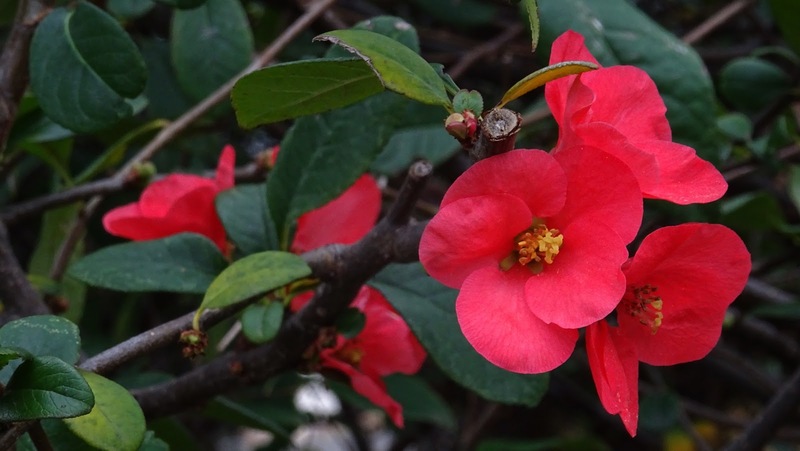 I'm sure I saw the blossom of japonica... and now I know the name thanks to this article!!... Have a sunny weekend of june! So beautiful !! I love this color !! beautiful image and flower Nick. Lovely and colorful bloom with good info Nick. Thank you for hosting! What a beautiful flower and so nicely captured on top!